On the Monday before I headed to Prague my friend and teammate Kelly from Poland arrived at my flat and we headed to the office. 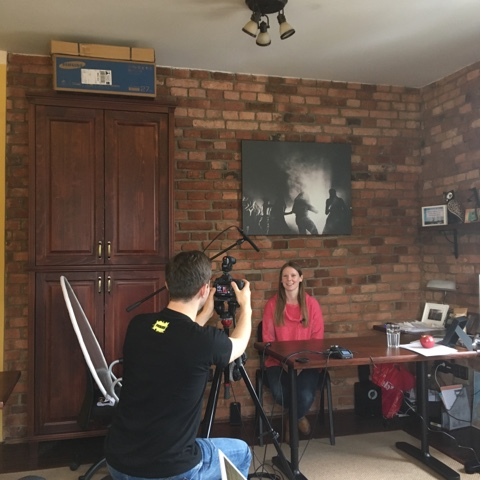 So part of my day was spent with this view – Ondra recording Kelly for an online training course for those giving the talks at our camps this year. As we were filming, preparing what would be said, and discussing what we most wanted to communicate, it reminded me again why I am here and why it is such a privilege to join this ministry. In serving camps internationally I am usually juggling details, keeping track of things, and helping to deliver materials and resources to do camp well. But doing camp well is in no way the end goal. In doing camp well, by weaving the theme throughout all the different elements of the week, and creating excellent resources to be used, we create a beautiful environment in which the gospel is clearly presented and students get to experience the love of Christ. And we have an incredible opportunity as we come alongside local churches to empower their youth groups to reach their friends. Believing students invite their friends to camp and advertise in local schools knowing that at camp their friends will benefit from an excellent English, sport, or music programme, and they will hear about a God who loves them and wants to have a personal relationship with them. This year we are praying that we will do one hundred and thirty camps across our thirteen countries. Excellent talks have been written for each evening that beautifully communicate the gospel. We’re praying that each student hears the gospel individually and is personally challenged to follow Christ, and we’re training our short term teams and interns in how to do that well. We’re so aware that the horse is prepared for battle but the victory belongs to the Lord, and we’re boldly asking Him to already be powerfully at work in the lives and hearts of the students who will be at camp this summer. We’re asking Him to draw many to Himself, and that they will become faithful disciples who make disciples in these nations. All for his glory. A Czech Intensive in Prague!